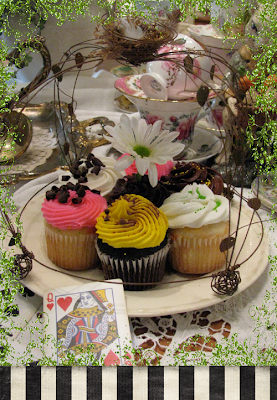 **My Desert Cottage**: It's Time for the Mad Hatter Tea Party!!! Oh I’m so glad you could make it. I’ve been so excited about this day! I thought it would never get here! Well , you’re right on time!!! Some of the guests are already here. This is Rocky. He is the love of my life. (Don’t tell my sweet husband I said that. dressed up for this affair. she chose to be both. Harley’s favorite color is purple. top hat and bow tie. 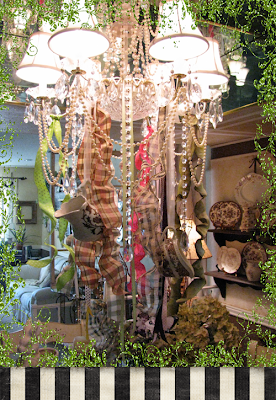 Even the chandelier got dressed up!!! Oh look! The guest of honor has arrived!!! The table is packed full of party goodness! I brought out my favorite silver tea set. I've collected them all over the place. Which one would you like??? favorite food is dessert!!! 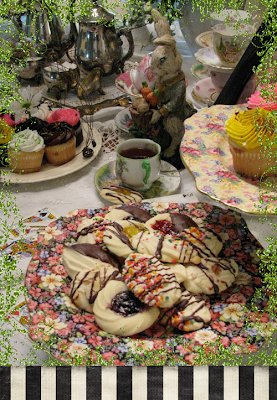 So with our tea we are going to have cookies..
chocolate covered and fruit filled!!! We are also having cupcakes!!! We have chocolate or vanilla. get help where she can!!! The food choices seem to be a big hit with one of my guests!! My goodness... Time does fly when you are having fun!!!! You are all a bunch of wild and crazy Tea Partiers!!!! Thank you so much for coming to my party. Now I have to get cleaned up. I’ve got hundreds of people to visit and I’m LATE, LATE, LATE!!!!! 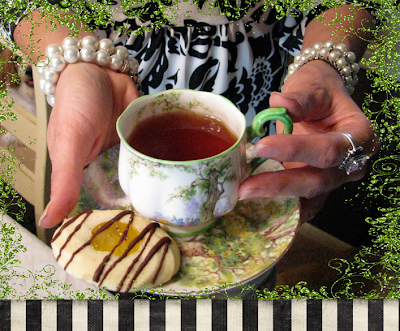 Make sure you head over to A Fanciful Twist to see all the other Tea Partiers! sign up for the next great party event...Where Bloggers Create. How simply charming is this blog..I absolutely love being involved in events such as this to see the creativeness of all of us! How wonderful...and to bring us to new blogs that we haven't seen before. Your tea party is just absolutely beautiful and charming. I really enjoyed by stay and love the music you are playing...Smashing Job! Thank you for visiting me and sharing with all of us. I'm just speechless...just beautiful! 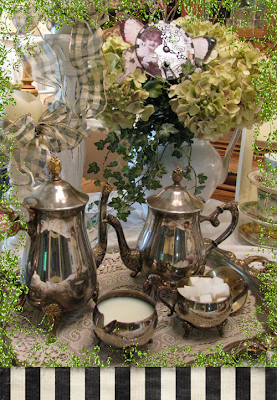 Enjoy the Tea Parties and have a beautiful weekend! A lovely tea with the most endearing company…. I too must take my leave and ride the party trail of the event of the year…. wonderful post - lovely tea party! 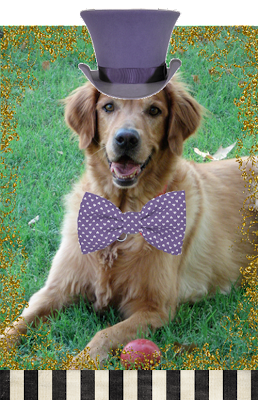 Your furbabies are so adorable in their party gear!! Happy Mad Tea Party to you! You are such a wonderful hostess, and of course I must not forget to mention the little furries too! 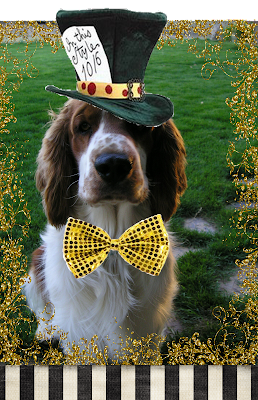 a big thank you to you and your delightful, and well dressed, pups - for sharing a cup of tea with me. That table!!! That chandelier!!! Those "guests"!!!! LOVE it!! Can I have a sampling of the sweet treats? :))) Yummmmmmm! Audible gasps when I saw the chandelier! I'd leave it like that ALL the time! 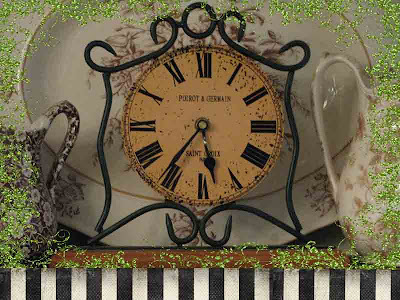 I hope you'll visit my Tea Party and see what I'm decking out the party-goers in! CUTE!!! You & I were on the same wavelength-come see your blog southern style-oh, but my puppy would have *none* of it, sadly! He called a stunt rabbit in, tee hee! One can never have too many sweet treats on today of all days! I love your dressed up guests, all quite dashing! Thank you for a fun party! Oh, this is just full of wonderful goodness. 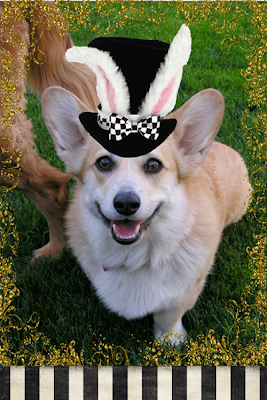 So charming, so pretty, such cute party goers with floppy ears! I enjoyed this party oh so much. Won't you join me and my fur baby at tea? What wonderful pictures and treats! I'm so very glad I stopped by. My name is Geralyn Gray and I am a blogaholic also. That's why I love a good party---and your guests are the best. Look how happy they look in their party hats!! I am looking forward to your creative space blog party. Love your mad hatters and the food looks devine! This is my first tea party! And you pampered me like a queen. The tea was devine. Dessert was yummy. 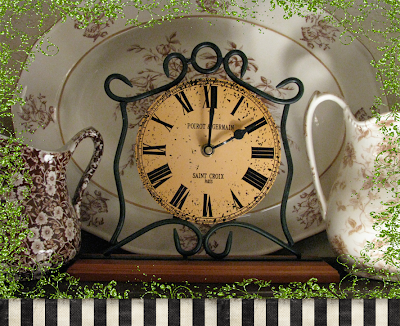 Your guests are so sweet, they sure know how to dress up for a grand tea party. I feel relaxed now after spending the day with you. I'm going to visit your neighbors now. 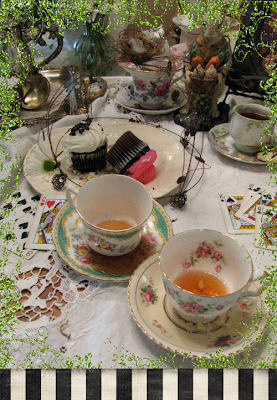 Your tea party was wonderful, love the photos especially your 4 legged babies, very creative. thanks for inviting us. Cute photos! I love your dogs! What a lovely party...I felt right at home immediately and was so happy that I was not late...as I had to stop party hopping for a bit (it's the sugar you know...) Your dapper dogs are just phenomenal and I would love to invite you all to my place for our party as well...you will fit in just perfectly!! I must come back and check out your cottage! Lovely!! Oh My Goodess, I think I just fell thru the rabbit hole! 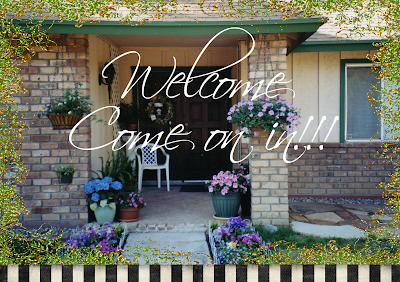 I just popped in for the Etsy Cottage Style Blog Party snd found your wonderful blog. I hope you can come sit on my porch for a minute. I am definately asding you to my blog list! 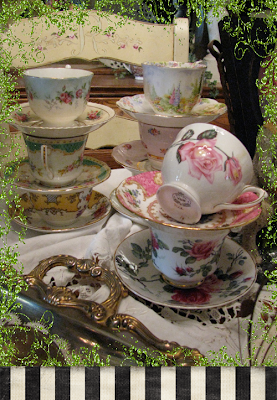 A lovely tea party with beautiful food and tea cups. Rocky, Jasmine and Harley are adorable in their hats. I can see why Rocky is the love of your life. 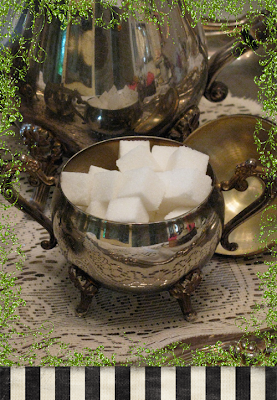 Whimsy, sugar, sparkle, tea and pups!!! What an enchanting party! and your guests are simply smashing! how daper! The cookies are jsut scrumtious- Thank you! Have a magical mad party day! i am also a Karin (an I, not an E) and i live in Scottsdale...nice to find a blog of a neighbor! what a lovely party and an amazing blog! thanks for having us over today, I'll certainly be back. 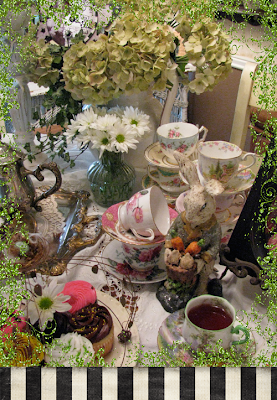 Another beautiful tea party! Your guests are gorgeous pups! And the spread is charming! Your tea party was amazing, all the treats and teacups were lovely, and your dogs are wonderful. Happy tea party day to you! Wonderful party! I love how your guests dressed up.. everything looks so pretty! great blog too! thanks for coming to my tea party and for the sweet comments! I'm glad you enjoyed yourself! have a sweet sunday! H Karen! 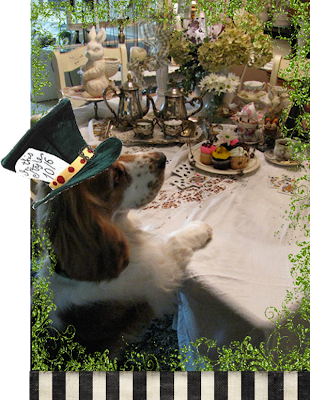 You have a lovely blog and I got a kick out of your dressed up dogs for the tea party! Your home is gorgeous and your tea party looked amazing! Your hatters had impecible manners. Oh I hope I'm not too late for some of your yummy treats! Be sure to stop by my party today and enter my giveaway. The tea kettle is still boiling! What a GREAT party! It's taking me forever to get around to everyone but I am determined! Your photos are so wonderful and I love your party goers! Beautiful magical BLOG!!! Oh, Jasmie and all the others are precious beyond words!!! Thank you for being such a delightful part of WOnderland. Your home is beautiful and your table setting divine!!! Now I am concerned, I recently sent you and e-mail an have not heard back from you. Perhaps you have just been busy preparing for your charming tea-party. So sorry I'm late. I just escaped my own Mad Party. I must say I've had an enchanting visit and your tea party guest were truly handsomely well behaved. Much better than mine. Oh and the vanilla caramel sounds delish. Thank you for the relaxing visit. Karen, thank you for the tea and crumpets. It was a beautiful party. Thank you for visiting my new blog and I will be sure to visit you often. What a simply lovely tea party!!! You are having fun,what wonders you created! I do love your blog. Which teacup is a fave? Hard to chose. But the one your holding with it's saucer is just perfect. Thanks, I'll eat my cake with the chocolate drizzle. yum! My goodness, what a wonderful party. I clicked on your name on a comment you made on another post because of our name. I remember a Karen Valentine who was an actress years ago. No, I didn't think you were her, but I was delighted when I saw that you also live in Scottsdale. I've been here 20 years. I never liked the desert. I'm a beach - mountain lover, but now I love my desert. I guess we can get used to anything. Anyway, thanks for the party. Come visit my blogs sometime. One of them is called At Home in Scottsdale. I had so much fun at your party, yes I was late,late,late but couldn't miss this wonderful place. 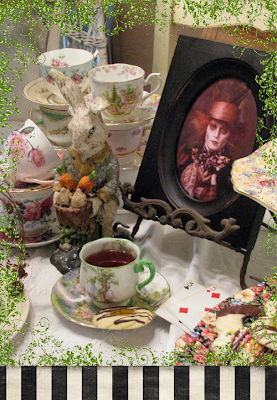 It is so curious that these Mad Tea Parties are still going strong! I've yet to clean mine up, so please feel free to follow me back down the rabbit hole to Haute Whimsy before life goes back to mundane! Sorry I'm Late-but what an extraordinary party you have here-I ❤ the dressed up Chandelier! It is fab! What a delightful tea party. Those guests are surely spiffy! I am so sorry to be so late! Well, now THAT was about the most fun I've had in days!!! Well, since the last tea party I attended where the host disguised the margaritas in the sweetest iced tea glasses:o) You are adorable and so much fun!!! I want to gather up all my friends and come right over to your house! The most beautiful party I've ever seen!